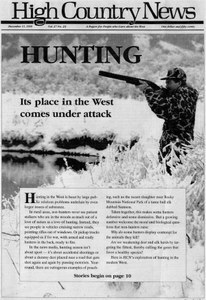 Hunting in the West faces public relations problems as well as questions about ethical and biological issues. Taxidermist John Stevenson discovers the art and craft of taxidermy. An excerpt from the classic "Meditations on Hunting" by Mexican writer Jose Ortega y Gasset. Idahoans argue about banning some forms of bear hunting. A writer muses on the contradictions inherent in his love for the hunt but dislike of killing animals. The group 1000 Friends of New Mexico hopes to encourage responsible land-use planning and stop suburban sprawl. Environmental journalists are invited to apply for a fellowship year at Harvard. A radio documentary "Writing the Southwest" features 13 Southwestern authors. "The Image of the American West in Literature, the Media, and Society" conference is planned for March. Artist Lester Dore's map of the plumbing of the Colorado Basin is available as a poster. Courses in Applied Fluvial Geomorphology, Stream Classification and Applications and River Assessment and Monitoring are offered. The Annenberg Rural Challenge seeks to reform rural schools. Second-rate national parks, "virtual" national parks, not ruthless feds, Barbara Cubin's woes, Catherine Crabill rails against greenies, Arizona Gov. Fife Symington willing to shoot spotted owls, jobs available in Aspen. Warm weather, intern Jenny Emery, corrections and emendations, Research Fund appeal, NewtWatch and us, HCN holiday gathering. The Forest Service is blamed when loggers cut trees within yards of a nest of rare goshawk fledglings, causing them to die. On Oct. 3, activist Tim Ream began a hunger strike to protest the "logging without laws" salvage rider. The Sierra Club Legal Defense Fund hopes to prove the salvage sale called Thunderbolt in Idaho's Boise National Forest is "arbitrary and capricious" in one of the first lawsuits against a salvage sale. Pueblo Bishop Arthur Tafoya agrees with the Catholic Human Development Commission that the Animas-La Plata water project is wasteful and destructive. Farmers lead the protest against Battle Mountain Gold Company's open-pit mine in Washington's conservative Okanogan County. Controversial former Northern Region Forester John Mumma is hired as the director of the currently embattled Colorado Division of Wildlife.